Possibly because I wanted to avoid packing for our move, I managed to focus my crafting energies a bit more this week and actually finished my Kaleidoscope quilt top for the Kaleidoscope quilt-along. I really liked the design option that made a larger star and circle that I had played around with last week, but I decided that it wasn't really suited to a quilt this size, since there would only be a few full stars showing on the top. So I decided to stick with the regular design for the quilt-along, and I alternated the blue fabrics with the green and brown fabrics for a kind of semi-organized scrappy look. I love the other design though so I can definitely see myself making another (larger) quilt in that design in the future! Some of the piecing with this quilt was a challenge for me. I think I cut my pieces fairly accurately, although they may not have been perfect, but I think the larger issue was that I was using too scant a 1/4" seam allowance... I used to have too large a seam allowance and I may have overcompensated (I do have a 1/4" foot, but not one with a rigid guide, and I think I was lining up my fabric with the wrong point on the edge of the foot). Anyways, the result was that on some of my pieces, the grey kaleidoscope triangle was significantly shorter than the patterned piece, and I was worried that the tip of my patterned kaleidoscope triangle would get cut off when I pieced the blocks together. The problem was most acute on about 10 pieces so I took them apart and pieced them again, being careful to line things up to avoid this problem. Even after that fix, my piecing was definitely still not perfectly aligned, so I was pretty worried that I would have a hard time lining up the points either in the center of my blocks or at the intersections of the blocks. Luckily, I was able to get them all to turn out pretty well by pinning really carefully and easing some of the seams, and then pressing everything into submission. I think the piecing on the finished top looks really nice overall, but it also does not lie 100% flat, so hopefully I won't get any puckers when quilting if I baste really carefully. I definitely think this is a great pattern, any issues that I had were as a result as my less-than-perfect piecing and/or cutting... and part of why I wanted to do with QAL was to challenge myself to improve my piecing accuracy, which it definitely did. I had never really chain pieced before and found it to be a great time saver, but I think that in the future I probably should do a test block before I go to town chain piecing, to identify any issues up front so that I can correct for them from the beginning. I am not sure if I will have time to quilt either this or my drunkard's path quilt before we move, although if I have time in between the packing (and a few other craft projects I have planned), it would be great to get one done. I am still planning to host a drunkard's path quilt-along this fall, probably starting in October, but I realized I may need to hold off getting more organized on that until after the move. 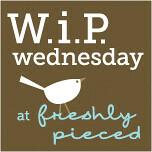 I'm linking up again to WIP Wednesday over at Freshly Pieced - head over to see everyone's fun projects! 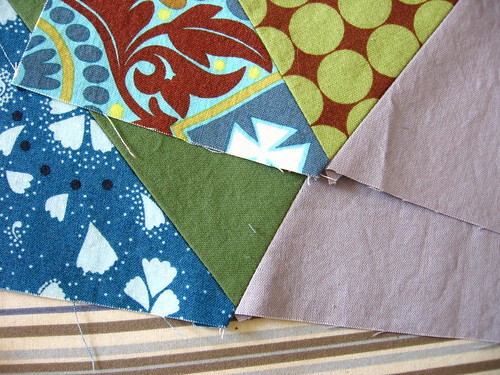 I am a big fan of the test block, it has save yards of fabric over the years. 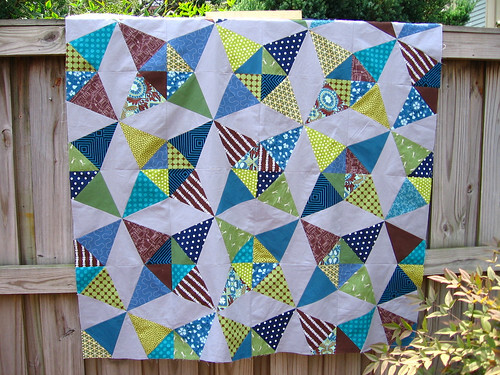 I love the colorway you used for this quilt and can't wait to see your quilt once you quilt it. I had similar issues with my seam allowances - frustrating! Still need to face putting the blocks together. Yours look fantastic though! you did a lovely job. the colors are fantastic. Your Kaleidascope top is looking great! Great colour and fabric choices. This top came out great! The scrappiness gives it so much fun movement. your quilt top is absolutely gorgeous!!! rest sure in that fact and don't sweat the scant seams. Stunning quilt -- great colors and perfect points. All quilters need seam rippers - even the pros! (I always need to have a spare!) Great job! I love it and the piecing looks really good in the photos.With such high contrasting colors and patterns every little thing will stand out. I know with me I zoom in on any part that isn't perfect. Great job!! Oh it is beautiful! All your corners and points looks good to me! 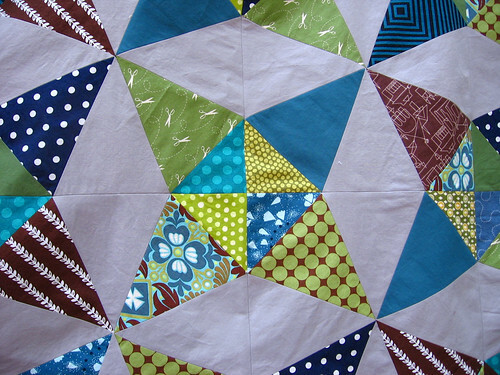 I like the fabrics you chose for your Kaleidoscope quilt. The quilt top looks great!! I also did the quilt along, but silly me didn't check to make sure I had enough background fabric and ran out half way through! Now I can't find the same color anywhere, so I'm not sure what I'm going to do! Looks beautiful! Congrats on a finish!